Jamaica's first dancehall superstar Yellowman ushered in a new era in reggae music. His early '80s success brought the popularity of toasting (reggae's equivalent of rapping) to a new level and helped establish dancehall as the wave of the future. 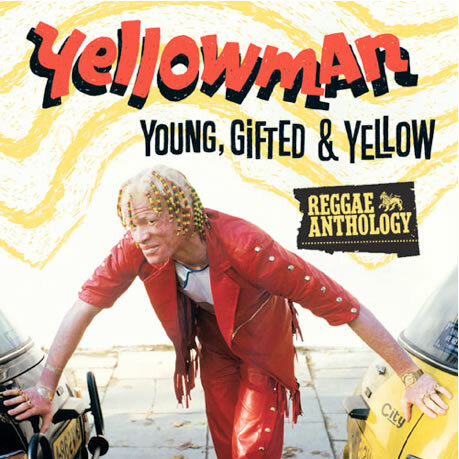 On April 23, 2013, 17 North Parade will unlock its vaults once again to unveil the latest Reggae Anthology, Yellowman's Young, Gifted & Yellow, from the undisputed king of dancehall. This powerful 2CD/DVD collection features 40 fully remastered essential tracks of both classic and obscure material throughout Yellowman's prolific career. As an added bonus, the deluxe package will include thorough liner notes written by reggae historian Noel Hawkes and a 25-minute DVD of Yellowman's 1988 electrifying live performance at Jamaica's longstanding annual music festival Sumfest. The first set of the anthology opens with his early ‘80s breakthrough hits like "Mad Over Me" recorded for Channel One, “Death of Barnabas,” "Operation Eradication" and the infamously “slack” "Shorties." The second disc moves toward his later hits like "Who Can Make the Dance Ram" (a rewrite of "The Candy Man"), "Zungguzungguguzungguzeng" (one of Jamaica’s most sampled songs to this day), "Nobody Move Nobody Get Hurt" and a cover of Fats Domino’s "Blueberry Hill." Through adversity and triumph, Yellowman (born Winston Foster on January 15, 1956) still remains one of most pivotal music figures out of Jamaica today. He was able overcome Jamaica’s negative social stigma on albinism and embrace his uniqueness (hence his moniker Yellowman). He grew up in a Catholic orphanage known for its musical alumni called Alpha Boys School in Kingston, where he mastered his craft. The inimitable dancehall deejay rose to prominence in the 1980s during a time when roots reggae was flourishing with megastars like Bob Marley, Peter Tosh and Jimmy Cliff. In 1981, Yellowman signed to Columbia Records and made history as the first dancehall artist to ink a deal with a major U.S. label. During this newfound success, he faced the hardship of battling cancer and had to undergo an invasive jaw surgery to remove the malignant tumor. His bouts with the disease pushed him into more thoughtful, socially conscious territory in the '90s. However, his initial "slack" style of more sexually provocative lyrics and cheeky rhymes still remains the most influential and paved the way for countless dancehall toasters to follow. He is also embraced by the hip hop community in the States. Yellowman has collaborated with Run DMC and his iconic 1983 hit “Zungguzungguguzungguzeng” has been sampled by rap heavyweights like KRS-One, Notorious B.I.G., 2pac, Dead Prez and Black Star (Mos Def and Talib Kweli). For all press inquires or requests please contact me. Thanks.